Not to brag or anything, but we're pretty proud of this five-star Velvet Chocolate Cheesecake—and awfully pleased with the fan mail it gets from reviewers! Preheat oven to 375°F if using a silver 8-inch springform pan (or to 350°F if using a dark nonstick 8-inch springform pan). Crush 20 of the cookies; mix with margarine. Press firmly onto bottom of pan. Stand remaining 10 cookies around side of pan; set aside. Reserve 2 Tbsp. of the sugar. Beat cream cheese in medium bowl with electric mixer on medium speed until creamy. Add remaining sugar, the cocoa and 1 tsp. of the vanilla; mix well. Add eggs, 1 at a time, beating on low speed after each addition just until blended. Pour over crust. Cover tops of cookies with strip of foil to prevent overbrowning. Bake 50 minutes or until cheesecake is puffed and almost set in center. Remove from oven. Mix reserved 2 Tbsp. sugar, the sour cream and remaining 1/2 tsp. vanilla until well blended; spread evenly over cheesecake. Return to oven; bake an additional 10 minutes. Run knife or metal spatula around rim of pan to loosen cake; cool before removing rim of pan. Refrigerate 4 hours or overnight. Store leftover cheesecake in refrigerator. Looking for a special treat? 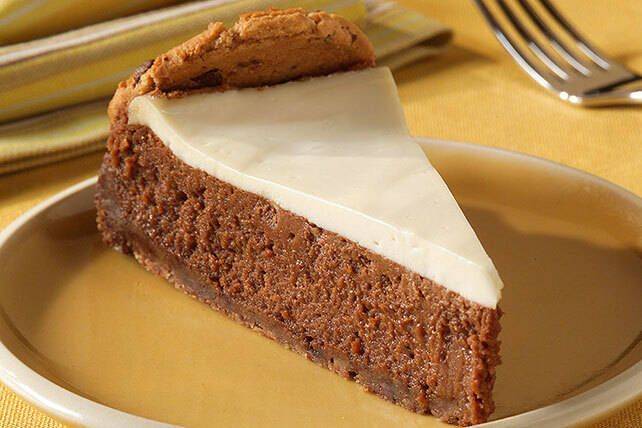 One serving of this cheesecake is full of chocolatey flavor. To easily crush cookies into crumbs, process them in a blender or food processor. Garnish with 3/4 cup thawed COOL WHIP Whipped Topping and 10 drained maraschino cherries just before serving.